Definitely easier to capture shots of plants/flowers than flying insects and creeping reptiles, right? Flowers are so well-behaved, like inanimate objects for still life painting, unless swayed by the wind. And, one can always choose to photograph them later when the wind subsides. Not the flying insects though. The fluttering butterflies, bees and others just zoom into your garden, not caring two hoots as long as they got their nectareous drink from your flowers and then disappear without a trace. Chasing after them for a photo shootout can be quite a hassle! Nevertheless, it’s sheer bliss whenever I do succeed! Sharing here the following happenings in our tropical garden in February 2013. Where there’s sugar, there’s bound to be ants! 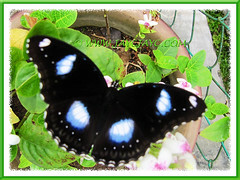 This fluttering beauty sure knows where to find its sweetened drink. Commonly known as the Great/Common Eggfly or Blue Moon Butterfly, it headed straight for the blooms of Pseuderanthemum reticulatum (Golden Net-bush) and contentedly enjoyed the nectar and basked in the sun for a few moments before taking flight. I’m so very glad to have photographed this lovely species that visits our garden quite often, this time round. There were many missed opportunities as I’m not always readily ‘armed’ with my camera. 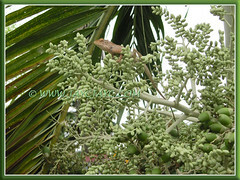 Also known as Garden Fence Lizard, it simply love to ‘play hide and seek’ on the Manila Palm or Christmas Palm tree that we had planted at the sidewalk, outside our home. That’s just the place where it’s sure to get mouthfuls of hoverflies and other tiny insects that swarm on the flowers of this palm tree to feed on the nectar. 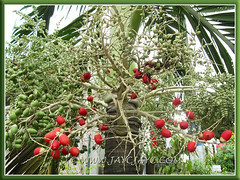 Our 7-year old Christmas Palm has been flowering in abundance since late 2011. We were surprised to observe that every withered frond that is removed will reveal a budding flower stalk beneath. No wonder the tiny flower flies are attracted to them and the monster(s) – the Crested Tree Lizard (its other common name) is awaiting to close in for the kill. Hmm… a vicious circle where the fittest survive! And who is eating the ripened fruits, I wonder? John says it can’t be the garden lizards, probably the squirrels. What do you think? flowered again. 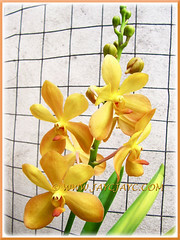 We’re delighted as this is the first time the Mokara orchid flowered after our purchase of it in October 2011. What a long wait! 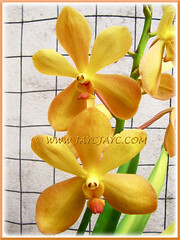 Worth waiting though when they shine through the other yet-to-flower orchids amidst it. A final visit to the garden nursery in the neighbourhood, before the Lunar New Year 2013 sets in on February 10th brought smiles to our faces. 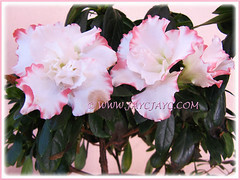 Two pots of bicoloured Azalea flowers in white with pink ruffled edges really caught our attention. We’ve never seen these petticoat-like blooms before… really attractive and gorgeous. It seems these are the latest variety from Taiwan. Loved your critter shots! 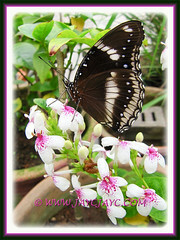 The Common Eggfly Butterfly is beautiful. 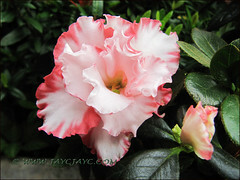 Your Azalea is just gorgeous too!